Why is The Entrekin Law Firm the best legal malpractice attorney team for your case? It’s because we have more experience than almost any firm in the country and a long track record of outstanding results. If you are a plaintiff or defendant with a legal malpractice case involving more than one million dollars economic damages, whether your case involves legal breach of contract, conflict of interest, abandonment, statute of limitations, or any other form of legal malpractice, call us toll-free about your case today! (800) 955-3457. Our team at The Entrekin Law Firm both defends and prosecutes cases all over the country. We value joint ventures and referrals, consistent with all applicable rules. 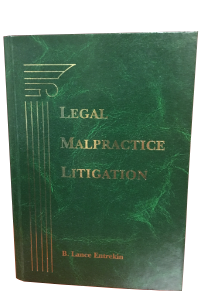 We also provide mediation services and expert consultant services in high dollar legal malpractice cases. Helping clients Nation-Wide with their Legal Malpractice cases. They must be held accountable. are being represented by a competent person. We have resolved legal malpractice cases for several million dollars on behalf of plaintiffs and successfully defended claims against law firms seeking several million dollars, all over the country. In one of our cases, a client who had defaulted on millions of dollars of real estate loans had complete immunity from a deficiency lawsuit by the bank under state statutes. The defendant attorney failed to make any effort to plead these statutes and as a result, the client was hit with a large deficiency judgment, despite the fact that state laws said the client was immune from such a judgment. This case resolved fairly quickly. We obtained a large, confidential settlement for a client who was catastrophically injured when a truck ran into him. His lawyer recovered the first $100,000 of liability insurance, took a $35,000 fee and then, because he failed to read the insurance contract, voided $1,300,000 in insurance coverage to which the client would have been entitled. The defendant attorney was working for one of the largest law firms in the State of Arizona when the malpractice occurred.